The Farmer and the Dail Photo Box provides a lovely home for your wedding day photo proofs. With a customized lid, the Photo Box will serve as a unique and timeless home decoration. The standard Photo Box will hold around 250 4x6 photos. 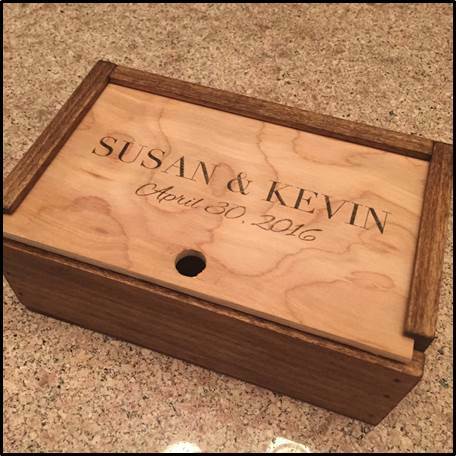 Inside, a divider provides space to hold a USB of your photos, or other mementos from your special day. This would also make the perfect box for other important life events such as sweet sixteens, baby showers, or even honeymoon photos! We also offer pricing for photographers who would like to provide their clients with a special Photo Box and personalize their gratitude. We can customize the flip side of the Photo Box Lid with the photographers logo, or other message. Need a larger box? No problem! Contact us with the size you need, and we will gladly provide pricing options. Exterior Dimensions: 9" x 6" x 3.5"
Interior Dimensions: 8" x 5" x 3"